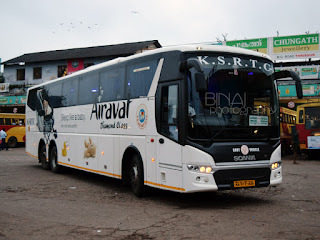 The search for a ticket to return from Kerala to Bengaluru was vague. I, TW and my parents were travelling - buses weren't an option - I was looking at trains at that point. I hadn't considered flights as an option since we were traveling during peak season (Diwali holidays). As I looked at all the options, I thought of checking flights too - the Indian LCC market leader offered tickets in the 1.2k range, while the world's leading LCC offered even cheaper tickets. Their app offered heavier discounts, and I managed to get four tickets, at what could be called a "steal" - working out to a little over Rs. 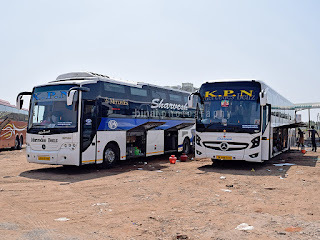 800 per pax! I had checked in through the app earlier that day - the app doesn't let you select seats during check-in. Seats need to be added through the modify booking page - and they charge for seat selection. I had to be content with the seats allotted by the system - our seats were spread over two adjacent rows. I decided to try changing the seats at the airport check-in counter. It was a busy day at home - we had arranged a vehicle to drop us at the airport two hours before our flight. The four-wheeled autorickshaw, aka Tata Iris, puttered on its way to the airport - thirty-odd kilometres from our home. The driver took a new route, that was full of curves, but well laid and had very few vehicles along. We got to the airport a little past 2100hrs. The airport was crowded - there was a long line of departures at this hour. The baggage screening area was packed - our queue moved slowly. We headed to the check-in counters after baggage screening to check-in our bags - my request for a change of seat couldn't be honoured since the flight was full! We got our boarding passes by 2125hrs, and we moved to security check. This place was even more crowded - only two screening machines were open, and only two queues were open! The queue didn't move for a while, and even when it moved, it crawled. Another queue was opened a little later, and this reduced the queue a bit. We were done with security check by 2138hrs. The security hold was just filling up, and I could manage to find space for the four of us, together. The airport was slowly filling up, and we had departures all the time - majority by the Indian LCC leader. The aircraft for our flight came about 10 minutes before scheduled departure. 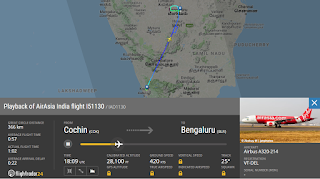 Of late, AirAsia India has been registering their aircrafts after cities they operate to. 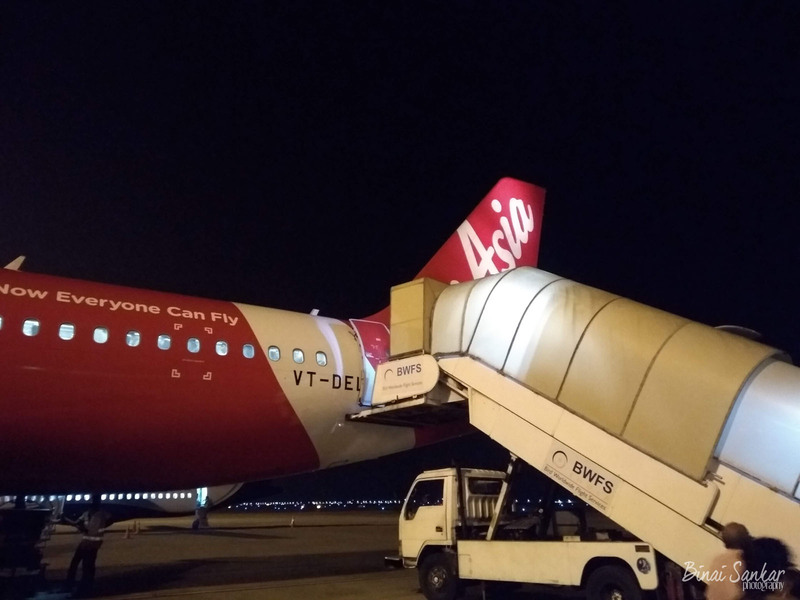 The aircraft flying us to Bengaluru that night was VT-DEL, a 2011 Airbus A320-214, delivered to AirAsia India in August 2014. The aircraft flew earlier with LATAM. Soon after incoming aircraft docked, a boarding call was made (2247hrs) - a long queue had already formed. We remained seated for the queue to shorten - boarding was quick. We passed the gate by 2257hrs - no tarmac coach was provided - the aircraft was just a few metres away. We walked down to the aircraft a little later - boarding was slow, and a long queue had formed on the boarding stair - we were inside the aircraft by 2300hrs. Two flight attendants were at the door - neither of them were interested, and were busy chatting with each other. There were no attendants helping passengers leave their bags in the overhead bins either - this explained why boarding took its time. A "Boarding Complete" call was made by 2302hrs, and all ground personnel were requested to deplane. Doors were armed by 2304hrs. Welcome announcements were made soon later - Capt Priya and First Officer Gagandeep were in charge of our flight. I did not note down the names of the flight attendants - none of them, to be honest, put up service that could be recalled by name. We were pushed back by 2306hrs, and commenced taxi by 2309hrs. The long taxi to Rwy27 took its time - getting there by 2315hrs. We were airborne by 2316hrs. We took off to the west, and then turned around, set course to the North-east. The seatbelt signs were turned off at 2321hrs. Food trolleys came out soon - passengers with food were served. We hadn't booked anything, and weren't interested either. The trolleys were pushed around without much efforts to sell, immediately followed by a round of clearing. Lights were dimmed a little later - I tried sleeping, but to no avail. The Travel360 magazine had quite some travel write-ups, which kept me occupied till the landing call was made. 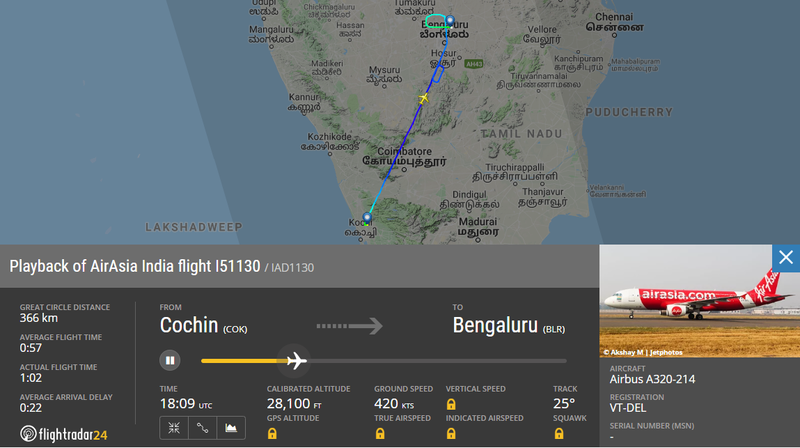 Midway into the flight, the captain announced that we'd be delayed by about 15 minutes beyond our expected arrival time (which was already 15 minutes behind scheduled arrival time) due to congestion at Bengaluru. We had to hold for a while as well. 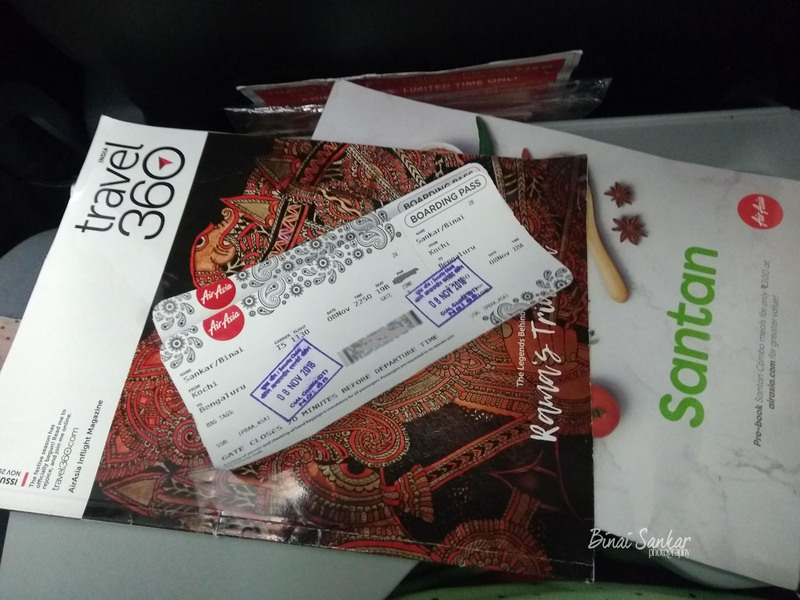 travel360, the santan menu & my boarding pass.. The seatbelt signs were back on at 2359hrs. We touched down at 0017hrs on Rwy09, followed by what I felt was the hardest braking I've experienced. We docked at Stand #40 by 0020hrs. Deplaning was confusing - the forward door was opened - the FAs announced passengers to move to the forward exit. A little later the aft exit was opened, and the crew now asked passengers in the rear section to move to this exit - we were out of the aircraft by 0028hrs. 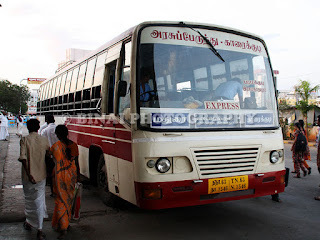 We got into the bus as the last passengers, and the packed bus got moving by 0029hrs. The ride to the tarmac was very long - I got a nice view of the magnificent line-up of widebodies set to depart on international sojourns. We got to the terminal by 0036hrs. 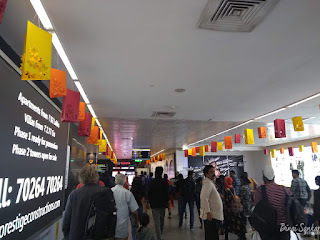 For some vague reason, they had allotted two flights to a single baggage carousel, and both these flights were full - baggage carousel was a mess, and it took quite some time for our bags to come. We got our bags by 0047hrs, and got out of the terminal a few minutes later. Bangalore Airport - decorated for Diwali, and was packed! All of us were hungry, and we headed to Subway for some light refreshment, washed them down with hot beverages from Chai Point and Hatti Kaapi. Meanwhile, I tried booking a cab on Uber - It didn't allot a cab, but gave a PIN and asked me to get into the first available cab using this PIN. For some reason, Ola showed very long wait times, and exorbitant fares as well. We headed to the Uber pick-up point - I was in for a rude shock - the agents there announced an average wait time of one hour, and asked us to join a queue, that was very long! We did join the queue, waited for a while - it was quite cold, and we all were tired - I headed to the Airport taxi counter next, and easily got a cab - a DZire from KSTDC - the well behaved cabbie dropped us home an hour later, for a price that was less than what Ola quoted, and a little more than what Uber quoted. Valuable lessons learnt! The tenth flight with AirAsia India, first on VT-DEL, went off as a very 'passable' flight. The crew were disinterested - they were present, mechanically presented the safety demonstration, did a quick service and disappeared into the galleys, only to be seen for quick cabin clearance for landing. They were at the exit though, and did smile and bid good night to the passengers. The flight was delayed - started late, had to hold and landed even later. They did take me from point A to point B safely, in a clean aircraft for price that I'd call a steal! Will surely repeat!